"Old ideas can sometimes use new buildings. New ideas must use old buildings." Detroit, Chicago, Cincinnati, and Toledo…. –these are only some of the many hard-working cities which built our great nation and are now in the process of rebirth, re-tooling, and renewed growth in the twenty-first century. Constructing new facilities to attract new companies and new modern industries may seem like the logical thing to do, and in some cases may even be necessary. But these great metropolitan areas have fabulous historical buildings with many, many years of service left within them. Instead of the investment required to build new structures in these historical cities, many enterprising builders, architects, and construction professionals are instead choosing to rebuild and restore old historic structures to their original beauty and prestige to accommodate this renewal of industry and commerce. Restoring old structures has many financial and ecological benefits as well. For instance, new construction requires lumber and steel which are limited natural resources. According to the United States Green Building Council (USGBC), building construction accounts for 40% io the world’s usage of raw materials. Utilizing existing buildings and structures saves trees and the waste and pollution generated by the mining industry. Additionally, new generally requires approximately 50% materials and 50% labor while renovation projects typically require much less in materials –nearly half as much – and provide nearly double the jobs per dollars spent. Reusing, Repurposing and Reimagining saves unnecessary demolition costs and the debris that demolition generates –sending more garbage to landfills and off-site dumping grounds. Dry ice blast cleaning is being used with great success in many of these historic restoration projects, and it’s easy to see why. Dry ice blasting is the cleanest and most cost-effective restoration method available and saves the restoration contractor time, resources and thousands upon thousands of dollars. Restoring the original delicate finishes of historic facades, entryways, walls, and ceilings of beautiful, old historic structures is made much simpler and more cost-effective by using dry ice blasting. 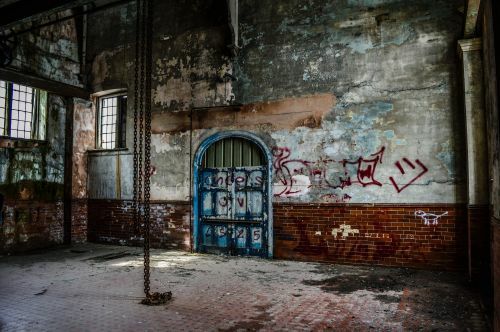 Paint, mold, smoke stains, soot, char, and years of dirt, graffiti, and neglect can be easily cleaned from wood, brick, and masonry surfaces by using a pelletized dry ice blasting system. Unlike abrasive or chemical restoration methods, dry ice blast cleaning does not etch, scratch, stain or damage the surface being cleaned. Instead, it only removes the contaminating materials –uncovering and restoring the historic materials to their original beauty and detail. Dry ice blasting does not rely on dangerous chemicals to clean and produces no hazardous fumes. Restoration with dry ice blasting is safer than most cleaning processes because it is non-flammable, non-conductive and easily controlled and contained. Whether you are a renovation contractor, building contractor, or business owner looking to expand your operation –give Dry Ice Works a call and let us take a look at your restoration challenge. We’re confident that we can show you how to save money while salvaging and preserving the historic beauty of the existing structures in your uptown, downtown, or rural area.